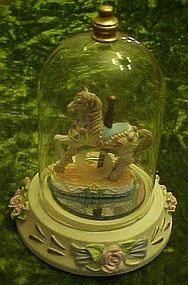 Pretty collectible carousel horse is made of resin and has a removeable glass dome that fits over with brass finial. Dome is etched or cut with a floral design on each side. Total height is 6 1/2" tall. Enhanced with pretty pink roses on the base. Felt bottom. Excellent condition.